Finally we moved to our brand new gallery, not far from where we were located for 20 years: Marnixstraat 127 in Amsterdam. The new location is still in the Jordaan, but much easier to access with public transport from Central Station and all other directions of the city (bus & tram stop across the gallery). We’re very happy being in this great authentic neighbourhood and our fantastic neighbours of ‘Duende Dos’, the famous Spanish tapas restaurant on the corner of Nieuwe Willemsstraat. 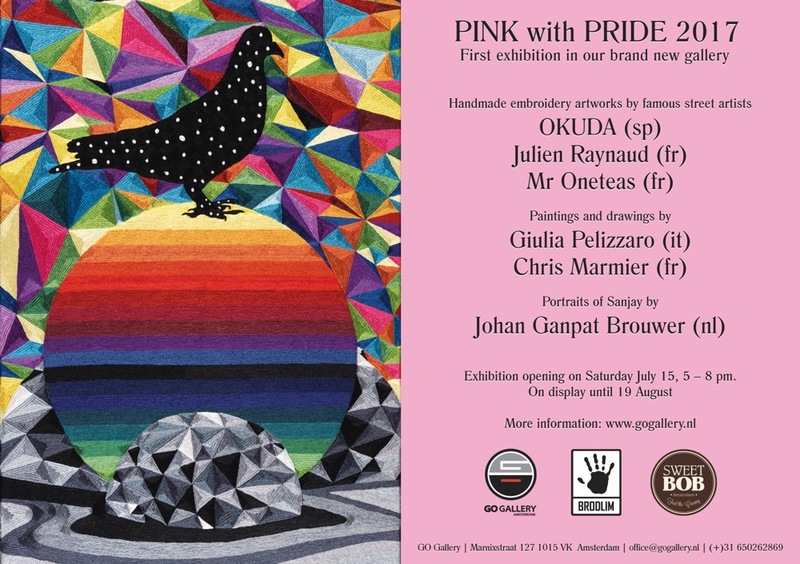 Our first exhibition is ‘PINK with PRIDE’, our annual Amsterdam GayPride exhibition. This exhibition shows the works of some young international talents, opening on Saturday July 15, 5 – 8 pm. You will be welcomed by the Brothers Grimm. Chris Marmier shows his new collection ‘Every day people..’ a humorous view on peoples lives. Giulia Pelizzaro Her artworks are mainly inspired by Street Art and doodle styles, she tells about ordinary situations towards contemporary lifestyles. Johan Ganpat Brouwer is the widower of Sanjay, an Amsterdam icon who passed away last year. Johan used the ashes to paint Sanjay’s portraits. All proceeds from sales will go towards foundation in Surinam to help improve the living conditions of LGBT and HIV community. Mr. Oneteas : Defenitely an artivist ! Mr. Oneteas started graffiti in 2005. As a self taught artist, he developed his original style inspired by travelling, various encounters and exchanges and this way has left his trace in the streets of foreign capitals and major cities. His workshop art focuses on planned obsolescence. As a matter of fact he gives a new life to materials and articles of consumption from the past, thus illustrating the evil consequences of waste in our society. He mostly gets his inspiration from our media-crazed, political and cultural environment. By diverting images and news items from their context, he gives us his critical outlook on society in a detached humorous way. JULIEN RAYNAUD : « Is the today’s Picasso » ? Julien Raynaud is a self taught 27-years-old painter whose style is an affealing mix of Cubism and street art. He paints in bright colours with spray paints and acrylics. He gives us an insight into his personality through paintings inspired by his own life, that convey sincerity, love and hope : a quest for a better world, a wish to make life better, less cruel, because he has de nitely kept a child’s outlook on life. OKUDA is a Spanish artist born in Santander in 1980. His work conjures up life’s meaning and contradictions. As a matter of fact, artist OKUDA intends to make us ponder over the coflicts between modernity and the deeply rooted traditions of mankind, as well as war and violence. The name Brodlim comes from the French words broderie – limité, in English embroidery – limited, because they only sell limited numbered artworks. Brodlim is the name of the collective of two young French entrepreneurs. 3 Artists are members of the collective as artists collaborators. Every year 3 new artists joins the collective by doing artistic collaborations. In India, they work with around 10 people, belonging to one family. The embroidery is done by only men. At the beginning it took them more than a year to launch the first artworks, but now they all have more experience. The technique used for the embroidery is hand chain stich, all colours are created with natural pigments. For an artwork of 80 cm by 80 cm it takes around 100 hours of embroidery. For an artwork of 155 cm by 95 cm it takes around 150 hours of embroidery. From the start to the finishing stage it takes around 6 months for one artwork. Born in 1978, Chris Marmier started drawing as soon as he could hold a pen and has never stopped ever since. He comes from a bi-cultural family (French and Central-African) who has travelled and lived in several countries. Throughout his life as a “flying gipsy”, he has discovered different cultures, met new people, learned new languages and has landed in Amsterdam. He’s always scrutinized the little details of a constantly changing environment that he will then reproduce and reinterpret through his drawings. Studying and working as a graphic designer just came naturally and drawing has always been around. It is a way for him to point out, dream, escape, share ideas and “get the people out of his head”. People’s relationships, beliefs, environments, feelings, similarities, differences, etc. are subjects that fascinate him. Drawing is a way to make a step out of the circle to observe the complexity yet simplicity of it all, and open doors to other conclusions. Technique: markers and paint on wooden boards. Giulia Pelizzaro is an Italian artist based in Amsterdam, who started drawing at a young age. Once she obtained her bachelor degree in Architecture, she went on to study Visual Communication master degree. Currently she is working as a Graphic Designer/Illustrator. Her art seeks to investigate and analyze, (at times with an ironic vein) ordinary situations towards contemporary lifestyles. Her artworks are mainly inspired by Street Art and doodle styles. She works with markers and spray paint across different kinds of surfaces like paper, canvas, 3D sculptures, and fabric. Johan Ganpat Brouwer, is de weduwenaar van Sanjay Ganpat Brouwer, één van Amsterdams artistieke en activistische iconen, die vorig jaar is overleden. Johan Ganpat Brouwer heeft een serie ‘Cinis Novum portretten gemaakt’, ja, hij heeft de as van Sanjay gebruikt om de kunstwerken te maken. Het is zijn eigentijdse manier om zijn partner te gedenken. De opbrengst van de verkoop gaat voor 100% naar de Stichting Sanjay Ganpat Brouwer. De stichting heeft als enige doel om het leven en de leefomstandigheden van de LHBT en de HIV gemeenschap in Suriname te helpen verbeteren. Johan Ganpat Brouwer, portrait of Sanjay. We are very pleased to present SWEET BOB at the opening of the exhibition. Come and try their fabulous sweets. Ricardo Koji, Renato Poletto and Andre Credie, three fellow entrepreneurs from Sao Paulo, Brazil, added the ‘Brigadeiros’ to the existing Dutch assortment of delicacies in the summer of 2016. These Brazilian iconic sweets – not a bonbon, not a truffle – are introduced in the Netherlands under the name ‘Sweet Bob’. Their concept store Sweet Bob Lab is based on Brouwersgracht 113. Here visitors can taste the many variations of brigadeiros.